If you need to know the best cam for a Harley, then you have come to the right place. DC V-Twin has been the place to shop for the best cam for a Harley. With a thousand of Harley cams available, from different manufacturers, making the correct choice can sometimes be over whelming. Our goal is to make your decision less complicated and put the right cam in your Harley that you will get the results you are after. One of the first steps in picking the best cam for a Harley is to determine what you plan on doing with the bike. Will you be using the bike for typical street riding and touring for pleasure or will it be an all-out drag bike? The type of riding you do will also be important. Do you mostly ride two up, around town traffic, or do you make long highway trips. Finally, we would like to know your riding style. Is it aggressive or conservative? Once we have this information then we can start helping you pick the best cam for a Harley. Of course now that we know your riding habits, we will need to know what bike you have and any engine modifications you may have already made. This is very critical, especially with the twin cam engine that has been around since 1999 with several different cubic inch versions over the years. DC V-Twin can also help you pick the best cam for a Harley EVO if you have an older style bike too. Before we jump into picking the best cam for a Harley, we need to bring a couple habits of cam shafts to light as well. One being that a cam that is too big will result in less than favorable low RPM power. While these bigger cams are necessary in modified engine builds, a more conservative cam may feel stronger to you in your street riding style. It’s all about picking the best cam for a Harley. Another thing to consider is a cam with longer intake duration will reduce static compression at low speed. This will reduce low RPM torque. Now, a longer duration cam combined with higher compression will add power to the middle and higher RPMs. This is what most riders are after, but the most important thing is to have the cam match the compression ratio and displacement of the engine, plus having the bike properly tuned. DC V-Twin will pick the best cam for your Harley……………..Call 478-988-4313 we are here to help you with some of our favorites below. HP103:For the rider who really wants the most top end horsepower. Easily make 100 horses from a stock engine with S&S intake and exhaust. Ideal for lighter bikes and racing applications where getting the most horsepower from a stock engine is imperative. MR103: These bolt in-cams are for the rider who wants more of everything without giving up low end torque for high rpm horsepower, or vice versa. More power all across the wide power band, from idle to red line. 510:Designed as a bolt-in cam for 88, 95, and 96 CID engines with compression ratios below 9.7:1, it is primarily intended for use with stock, un-ported heads. 3000-5500 rpm. Bolt-in overall. 585: Designed for 88 to 95 CID engines with compression ratios from 9.7:1 to 10.5:1 and 100 to 124 CID engines from 9:1 to 10:1 compression. Provides massive horsepower and torque increases starting at 3000rpm and holds steady all the way to redline. 3500-6000 rpm for 88" - 103" engines and 2500-5500 for larger engines. 640: Used in S&S T124 engines, this cam makes horsepower! Intended for engines of 95 CID or more w/compression ratios between 10.5:1 and 11.5:1. 3000-6000 rpm. Note:Stock valve springs in 1999-’04 big twin models can handle cams with valve lifts as high as .515”. Stock valve springs in 2005-up engines can accommodate valve lifts up to .590”. MR103 13° 33° 50° 22° 226° 252° .585" .585" 100° 104° .097" .191"
HP103 20° 49° 45° 26° 249° 251° .575" .575" 102.7° 101.5° .199" .206"
635 H.O. 19.5° 43.5° 58.5° 37.5° 243° 276° .635" .635" 102° 100.5° .186" .284"
Start any engine regardless of displacement or compression ratio,with a stock starter. The most innovative S&S product since the electric compression release system, these cams will revolutionize the starting of late model big twins. These cams also install just as easily as non compression release versions and require no extra parts or machining! Available in both economical chain drive and rock-solid gear drive. Don't get caught "dead" without them! The heart of our Easy Start cams is a centrifugally retracted, spring loaded, compression release lobe milled into the heel of each exhaust lobe. At cranking speeds, the lobe bumps the exhaust valve open slightly during the compression stroke, making the engine much easier to turn over. Once the engine fires and reaches 800 RPM, the lobe swings out of the tappet roller path, allowing the engine to run normally and with full compression. without breakage or compression release failure! 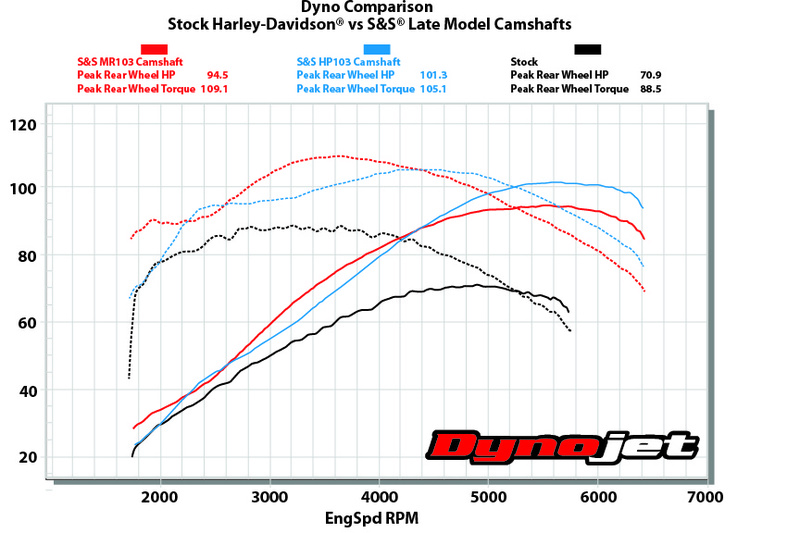 Note: Although several cam grinds were used in stock engines from 1999-’06, the timing specs of the 475G cams is most similar to cams used in 1999-’03 EFI engines. **551 cams are not recommended with compression ratio of 10:1 or higher.NOTE: Stock valve springs in 1999-’04 big twin models can handle cams with valve lifts as high as .515". Stock valve springs in 2005-up engines can accommodate valve lifts up to .590". HP103 20˚/49˚ 50˚/22˚ 249˚ 251˚ .575" 102.7˚ 101.5˚ .199" .206"
MR103 13˚/33˚ 50˚/72˚ 226˚ 252˚ .585" 100˚ 104˚ .097" .191"
475 2˚/34˚ 36˚/4˚ 216˚ 220˚ .475" 106˚ 106˚ .060" .060"
509 18˚/18˚ 46˚/11˚ 216˚ 237˚ .509" 90˚ 107.5˚ .174" .140"
510 20˚/38˚ 52˚/20˚ 238˚ 252˚ .510" 99˚ 106˚ .187" .178"
546 5˚/55˚ 52˚/5˚ 240˚ 237˚ .546" 115˚ 113.5˚ .126" .106"
551** 17°/19° 41°/17° 216° 238° .550" 91˚ 102˚ .178" .170"
557 6°/27° 39°/12° 212° 231° .557" 100° 103° .113" .146"
570 20˚/40˚ 55˚/20˚ 240˚ 255˚ .570" 100˚ 107.5˚ .187" .179"
583 5˚/18˚ 58˚/24˚ 203˚ 262˚ .583" 96.5˚ 107˚ .113" .206"
585 20˚/45˚ 60˚/20˚ 245˚ 260˚ .585" 102.5˚ 110˚ .186" .179"
625 20˚/55˚ 60˚/20˚ 255˚ 260˚ .625" 107.5˚ 110˚ .189" .184"
635HO 19.5˚/43.5˚ 58.5˚/37.5˚ 243˚ 276˚ .635" 102˚ 100.5˚ .186" .284"
640 25˚/60˚ 65˚/25˚ 265˚ 270˚ .640" 107.5˚ 110˚ .228" .214"
675 25˚/64˚ 70˚/25˚ 269˚ 275˚ .675" 109.5˚ 112.5˚ .235" .205"
Stock 2015 – BOLT IN – SPECIAL GRIND. 96” thru 120” - FOR STOCK HEADS!!!!! FOR THOSE THAT WANT TO BE #1. AWESOME SOUND. 3,000 RPM & UP. ALSO LOVES COMPRESSION. NEW,SUPER HOT 10.5 C/R. 96, 103, 107 & up.Head work, springs required. 50mm & up EFI TB or Carb. 135+ HP & TQ. Stock Bolt in street/touring. Very strong from idle through 5500 RPM. Light or heavy bike. Available for chain drive only. Gear drive recommended only with specially prepared lower ends. Bolt-In. Stock springs OK. Excellent for 96” & 103”. Pulls hard from idle to 5500+. Likes 9.2 to 10.0 C.R. Design based on the legendary TC590. It is a bolt-in for all 2007 & up. 9.2 to 10.2 C.R. Perfect for CVO 110”. Excellent 2500 to 6000+. Adjustable pushrods required. Great cam set for 96+” engines with 10.25+ compression. Excellent power band. Pulls hard 2500 TO 6500+ High performance springs required. TC510 and TC590 CAMSETS are available for both chain and gear drive. TC598G and TC630G are gear only. Bolt-in. Stock springs OK . Excellent for 88”, 95” & 103”. Pulls hard from idle to 5500+. Likes 8.8 to 9.8 C.R. This cam set will transform an 88, 95 or 103-inch motor into an animal from 2500 to 6000+. No case modification necessary. High performance springs required. Great cam set for 95”+ engines with 10.25+ compression.Excellent power band. Pulls hard 2500 to 6500+ High performance springs required. High lift version of the incredible TC590. Best choice for big inch and/or high compression 95”. 10.5 or higher C.R. High performance springs required. 508: Bolt-in cam intended for stock engines with less than 10:1 compression ratio. Quiet valvetrain with excellent low/mid range torque for touring and 2 up riding. 510V: Bolt-in cam that works well with stock or ported heads. Improved ramp design results in low valve train noise. Meant for engines up to 96" and 10:1 compression ratio. 3000-5000 rpm. 520: A replacement part for S&S emissions certified engines, this is a short duration emissions cam with very little overlap to reduce emissions of unburned hydrocarbons. Requires high lift springs and normal clearance checks. 1000-4500 rpm (80"-96"). 543: A replacement cam for newer S&S 4-1/8" bore V-series emissions certified engines for OE and custom applications. High lift, short duration and no overlap. Requires high lift springs and normal clearance checks. 1000-4000 rpm (111"-124"). 546: A replacement cam for older S&S V-Series emissions certified engines, this is a short duration emissions cam with very little overlap to reduce emissions of unburned hydrocarbons. Requires high lift springs and normal clearance checks. 1000-4000 rpm (111"-124"). 561: For 80"–96" engines at 9.5:1–10.5:1 compression ratio. Provides strong midrange power. 3000-5500 rpm. 585V: A versatile cam for 80" to 96" engines with 10:1-10.5:1 compression, and larger engines with 9.5:1-10:1 compression ratios. 3500-6000 rpm. 600: An exceptional cam in any large displacement engine with 9.5:1 to 10.5:1 compression. 3500-6000 rpm. 640: For large displacement motors with compression ratios of 10.5 - 11.5:1, or smaller motors with 11:1-12:1 compression ratio. Does not require as much compression as the 631 and provides a more linear power delivery. 3000-6000 rpm. 675: Designed for use with S&S special application cylinder heads, but can be used with other cylinder heads with appropriate valve springs. Intended for large displacement competition engines of 120 cubic inches or more, and 11:1 or greater compression. 4500-6500 rpm. 508 11°/25° 50°/5° 217° 235° .508" 97˚ 112.5˚ .141" .110"
510V 20°/38° 52°/20° 238° 252° .510" 99° 106° .187" .178"
520 0°/40° 50°/2° 220° 232° .520" 110° 114° .086" .094"
543* Front -26°/52° 49°/-1° 206° 228° .543" 129˚ 115˚ .017" .083"
543* Rear -25°/44° 33°/-10° 199° 203° .543" 124.5˚ 111.5˚ .018" .053"
546 5°/55° 52°/5° 240° 237° .546" 115° 113.5° .126" .106"
561 32°/40° 50°/26° 252° 256° .561" 94° 102° .252" .210"
585 20°/45° 60°/20° 245° 260° .585" 102.5° 110° .186" .180"
600 20°/55° 60°/20° 255° 260° .600" 107.5° 110° .192" .184"
631 34°/61° 66°/29° 275° 275° .630" 103.5° 108.5° .281" .221"
640 25°/60° 65°/20° 265° 265° .640" 107.5° 112.5° .222" .192"
675 25°/64° 70°/25° 269° 275° .675" 109.5° 112.5° .235" .209"
*Emissions cams front and rear do not have identical timing. Negative values are due to special timing for reduced emissions. Notes: S&S can do a special order cam. Contact your S&S Customer Service Representative for more information. Not legal for sale or use on CA or EPA pollution controlled motorcycles. Copyright © 2019. New DC V-Twin | All Rights Reserved.